Smash Mouth's hit single "All Star" has inspired countless Internet memes since its 1999 release. "All Star" but it's a Bach chorale following the conventions of the common-practice period. There are hundreds, probably thousands, of variations of Smash Mouth's "All Star" on the Internet. The song seems like it was made to be remixed, mashed-up and squeezed through the meme machine. "All Star" variants are a staple of meme culture. When you search "All Star but..." on YouTube, you'll get back over a quarter-million results. So. Many. Memes. And to answer the age-old question: Yes. Smash Mouth has heard them. Lead vocalist Steve Harwell says the band took notice because it was hard not to. People are constantly posting the videos to the band's social media pages. The '90s-era ska-punk staples are reliving the song's original reverie, along with other hits like "Walkin' On The Sun," by releasing a new acoustic version of the band's 1997 debut album Fush Yu Mang. "People are really diggin' it on the Internet and social media," Harwell says. "We're kind of the thing right now." "All Star" was originally released in 1999 as a self-affirmation anthem and anti-bullying rally cry. "We were reading a lot of fan mail, back when people actually wrote things on paper," guitarist Greg Camp says. "We were reading all these things, and we were like, 'Man, all these kids had or are having the same problems that we had when we were kids. Let's do a song.' "
But the band doesn't seem to mind the meme fun. NPR played them one (which shall remain unnamed) that Camp called the worst he's ever heard. Camp's recent favorite somehow (allegedly) sounds like the Russian national anthem. "It's pretty amazing, actually," he says. "Are you guys living in a cave?" Camp asks. We ask the same of anyone else who claims not to have heard an "All Star" meme. I should've known that my music interview with Smash Mouth - yes, the '90s rock band - was going to be fun from the start. Actually, even before it started. GARCIA-NAVARRO: Then there was a call from a friend. KLOOSTER: I love it. Is that a Coldplay song? STEVE HARWELL: Let me call you when I'm done. UNIDENTIFIED CALLER: Sure. Yeah. Just hit me back. GARCIA-NAVARRO: I don't mean to interrupt. KLOOSTER: People are so rude. KLOOSTER: Don't they know we do this every morning? GARCIA-NAVARRO: Exactly. Well, big publicity tours - not so much anymore. 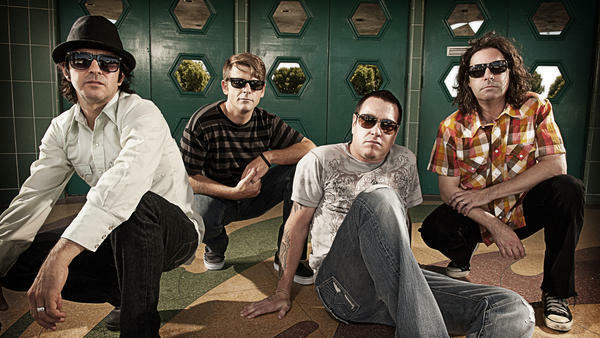 It's been a while since Smash Mouth's first big hit "Walkin' On The Sun." GARCIA-NAVARRO: It came off their debut studio album "Fush Yu Mang." This year marks its 20th anniversary, and they've rereleased an acoustic version of the album that's out now. GARCIA-NAVARRO: Lead singer Steve Harwell, guitarist-songwriter Greg Camp joined me from WPLN in Nashville, Tenn., along with Michael Klooster, who plays the keyboards. CAMP: I do. You know why? CAMP: Because I've been in Nashville all week. Everything sounds better here. That's what. GARCIA-NAVARRO: (Laughter) Welcome to the show, Nashville Greg. I want to start by listening to the acoustic version of "Walkin' On The Sun." SMASH MOUTH: (Singing) So don't delay, act now. Supplies are running out. Allow, if you're still alive, six to eight years to arrive. And if you follow there may be a tomorrow. But if the offer's shun, you might as well be walkin' on the sun. GARCIA-NAVARRO: Tell me. Why an acoustic album? Why now? HARWELL: Well, it's - this is Steve Harwell here talking. And we wanted to do it because it was our 20th anniversary and wanted to remake it, you know, more stripped-down and campfire-y (ph). CAMP: Steve and I used to always say that a good song, if it can be played on an acoustic guitar, it's - that's a good song. So we used to sit around the back of the bus and play, like, Depeche Mode songs on acoustic guitar. And so it was fun to actually do that song that way and confirm that it was a pretty darn good song. HARWELL: Pretty - you know, pretty darn good because you wrote it. CAMP: Yeah. I mean, because I'm not - I'm Nashville Greg. GARCIA-NAVARRO: (Laughter) You did write this song. And you also wrote the song "All Star." Can you tell us what that's about? KLOOSTER: And we were reading all these things. And it's like - we're like, man, all these kids having the same problems that we had when we were kids. Let's do a song, you know? It's, like, it made people feel better. And we get a lot of not the same kind of mail anymore, but, you know, people basically say thanks for that. GARCIA-NAVARRO: Yeah. It's taken on a life of its own on the Internet. It's been remixed and mashed up hundreds of times. We're going to hear a couple now. UNIDENTIFIED SINGERS: (Singing) Hey, now. You're a plumber. Get your plunger, go plunge. Hey, now. You're a rocker. Get your guitar, go grunge. And Bowser's stinky and gold. Only superstars get the gold. GARCIA-NAVARRO: Yeah. I need some reaction here from all three of you (laughter). HARWELL: You should've seen our faces. KLOOSTER: Did you guys make that? KLOOSTER: OK. Good, because I'm going to say that's the worst one I've ever heard. GARCIA-NAVARRO: Yes. But tell me how - when did you guys realize that this was, like, a thing, that all these remixes and memes were a thing? CAMP: People posting it on our walls constantly. GARCIA-NAVARRO: Yeah. And do you have a favorite? KLOOSTER: There was one pretty - I thought pretty interesting was the Russian one that just came out. GARCIA-NAVARRO: There's a Russian one? GARCIA-NAVARRO: Why is Russia everywhere? I want to have one conversation that doesn't involve Russia. But go on, please. KLOOSTER: Somebody had taken it and ran Steve's vocal through, like, you know, some sort of, like, harmonizer, like, pitch correction thing. And it made the whole song sound like the Russian national anthem, I guess. HARWELL: (Singing) Somebody once told me the world's gonna roll me. I ain't the sharpest tool in the shed. KLOOSTER: Yeah. It's pretty amazing, actually. KLOOSTER: Fourteen, 14 and a half. KLOOSTER: Twenty-five and a half. GARCIA-NAVARRO: Twenty-five and a half. It's always important to get that half in there. GARCIA-NAVARRO: But, seriously, when you sort of revisit something from when you were young, and you look at it now, what do you think? HARWELL: People ask me all the time. They say, Steve, do you get sick of singing these songs? And all that kind of stuff. And I'm like, no. We're proud to have these iconic songs that Greg has written and be able to perform them every night, you know? So it feels good. CAMP: ...Like, showing up to the studio this morning brought us back to when we were on the road for those first few records. You would go play a show and then drive to the next town and wake up in the morning. And you're in front of this radio station. They're like, you've got to be there at, like, 8 in the morning. HARWELL: That's our next hit. GARCIA-NAVARRO: (Laughter) All right. And I just have one last question, which is "Fush Yu Mang." What does that mean? KLOOSTER: Did you ever see "Scarface?" GARCIA-NAVARRO: Did I ever see "Scarface?" I'm from Miami. KLOOSTER: It's basically the way Al Pacino's character says [expletive] you, man. KLOOSTER: Let me tell you something. KLOOSTER: I never liked those guys. CAMP: You want to kill me? Fush yu. HARWELL: Look at the pelicans. Look at the pelicans. HARWELL: Fly, little pelican. Fly. GARCIA-NAVARRO: Steve Harwell and Greg Camp and, of course, Michael Klooster on the keyboards of Smash Mouth. The 20th anniversary edition of their album "Fush Yu Mang" is out now. Thank you so much. HARWELL: (Singing) Somebody once told me the world is gonna roll me. I ain't the sharpest... Transcript provided by NPR, Copyright NPR.